Kathleen Sheard is teaching in Seguin, Texas in June. The week prior to teaching she is heading to Padre Island in search of Kemps Ridley Sea Turtles or Green or Loggerhead or ….If you would like to join her there please email or private message her on Facebook. A&A Products, 1075 Marrou Rd., Sequin, Texas. June 3/4 and evening of June 6, 2017. Contact Matt Grones at (830) 303 8021 for details. In the workshop we will be doing two artist studies of wildlife. Students will need to bring pictures/photographs of wildlife they would like to do. The photographs can also be of domestic pets, landscapes, flowers or people. Detailed pictures of the eyes, nose, ears or mouth of the photo you are going to do is helpful. The first project will be a 6″x6″ and the second up to a 9″x18″ rectangle. As time permits we possibly will do detail squares or color studies. 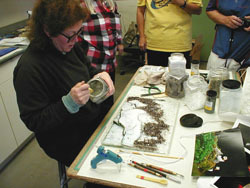 The process is the micro mosaic kiln formed glass technique. This class is designed for people that have some previous glass cutting and fusing experience or by consent of the instructor. The workshop is 2 days and one evening session. A pre workshop letter is sent out that gives more details and lists what tools and other materials will be needed. Cost of this workshop is $325. Take both workshops and receive 10 % off the workshops. Matt will provide a light breakfast fare and lunch! A&A Products, 1075 Marrou Rd., Sequin, Texas. June 5 to 9 and morning of June 10, 2017. Call Matt Grones at 830 303 8021 for details. In addition to the workshop details listed, Kathleen will be going to Padre Island, prior to the workshop to volunteer with sea turtles. (information being researched now) A scheduled time frame for a sea turtle conservation talk will be determined and artist studies from her Cycle of Life: Sea Turtle Glass Sculpture – Environmental Art Education Project will be on display at A&A. This workshop is for students who have previously taken the beginning Wildlife Art in Glass. (or have consent of the instructor) The first project will take multiple pre fused pieces (2 to 4 depending on complexity) mixed with frit, and incorporate parts into one finished miniature vitreous painting. Students need to come prepared the first day with photographs ready to start this project. As time permits additional studies include layering frit with multiple firings to increase depth on existing pieces, color mix studies, detailed studies of specific areas of a face (wildlife or human) and/or floral/landscape. This is an intensive 5 day workshop. A pre workshop letter is sent out that gives more details and lists what tools and other materials will be needed. Intermediate to Advanced Workshop. Cost of this workshop is $675. Take both workshops and receive 10% off the costs of the workshops. This workshop incorporates parts of the other workshops but expands to include color reaction, color mix, chemical reaction, shadow, light, and details. It is my “process” workshop. We will ask the questions – “Just how do we get depth of field in a flat piece anyway?” Does a black bear have to be black to know that it is a black bear? Does an African lion have to be shades of amber? Can the lion be turquoise and orange… and still be a lion? Emphasis on technique and exploration through glass frit artist studies which will help to make a larger project a stronger statement. As time permits a demonstration of how to build sections for a multiple pre-fused piece will be shown. This workshop can run from 4 to 6 days. Basic frit fusing required and or the consent of the instructor. A pre workshop letter is sent out that gives more details and lists what tools and other materials will be needed. Beginning to Intermediate. In this workshop, students will learn the process Kathleen Sheard uses in her own studio from her artist studies to the larger vitreous wall paintings. Basic frit fusing required or the consent of the instructor. This workshop is conducted in the field and then in the studio. Part of the workshop is spent in Wildlife Museums, Zoos, Aquariums or in the forest, at the ocean or in a wildlife refuge. The first class day will be in the field where you will take field notes and sketch or photograph subjects of interest. When possible, the class will be joined by biologists, naturalists or other knowledgeable personnel to provide information about the area and the flora and fauna you can expect to see. From a subjective viewpoint observations can be made about the activities in which the wildlife are involved, how they move, their stance and posture, and the surrounding environment that supports and shelters them. Research to gain additional information is important to round out your knowledge about your chosen subjects. Back into the studio artist studies will be done from field observations—wildlife or landscape. As time permits one or two other forays will be made into the field during the week and additional glass studies done. A pre workshop letter is sent out that gives more details and lists what tools and other materials will be needed. From notes and sketches to artist studies to large pieces, this workshop instructs you on the same step-by-step process used by Kathleen to produce her wildlife micro mosaics in glass. Kathleen offers private lessons to previous students that want to work on more extensive projects. This is done on a one to one basis at her studio in Montana. Length of session and pricing will be structured on an individual basis pending the advanced project or techniques the student wants to accomplish. Copyright 2017. Kathleen Sheard. All Rights Reserved. Copyright 2016. Kathleen Sheard. All Rights Reserved.